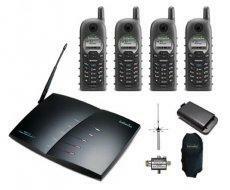 Cordless Phone System – Long Range, 4-Lines, Wireless! 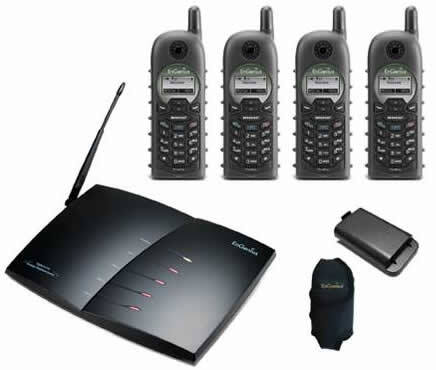 The EnGenius DuraFon PRO is the evolution of first the 4-line EP-490 and then the DuraFon 4X industrial long range cordless phone systems. It has the longest range of any 4-line cordless phone system in North America, and covers up to 12 storiesin buildings, 250,000 sq feet in a warehouse and 3000 acres in outdoor applications. The new DuraFon PRO handsets are our most durable yet, and while you can start with as few as 1-4 lines you can expand to that to as many as 32 port/lines by simply adding additional DuraFon PRO-BU bases. Users have a choice in portable handsets between the full functionality of the DuraFon PRO handset, or the optional DuraWalkie handset for those that only require a 2-way radio for internal communications. Upgrades include a new Lithium Ion Battery, providing 6 hours talk and 50 hours standby time – double the previous models. The voice quality is now louder and clearer than before. The handset features an extra loud ringer and an integrated headset jack. The battery is securetly enclosed in the phone compartment which is now more durable than ever without requiring an extra rugged case. Please note: The DuraFon PRO handsets will NOT work with your existing DuraFon 4X and EP 490 system. Also, if you have a DuraFon 4X system and need a base replacement once existing stock is no longer available, at an additional modest cost we canl supply a modified DuraFon Pro base station to replace your defective unit, thus maintaining the longevity of your existing DuraFon 4X system. Telephone Magic Inc. is a rare “EnGenius Elite Dealer”, so you always know you are getting the best pricing and service when you buy from us. Durafon PRO Bundle (as above) with added External Antenna Kit and 66′ low loss coax cable. DuraFon External Antenna Kit with 66′ low loss coax cable. 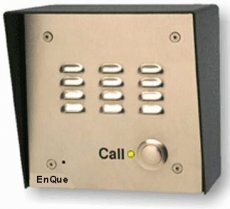 All Weather Call Box – push to talk / push once to connect with DuraFon handsets at a gate or door. If you are in the market for an EnGenius Durafon and you see a price displayed on a website, beware of purchasing from that company. Yes, we know this warning sounds self-serving, but it’s based on a very simple fact: According to EnGenius, authorized resellers of EnGenius telecommunication products are NOT allowed to display prices online. As a matter of fact, EnGenius representatives have told us EnGenius Corporation is taking appropriate legal actions to shut down the websites of unauthorized resellers. If you purchase from an unauthorized reseller, you get no warranty on your product. You may be purchasing used or FAKE EnGenius products. The EnGenius representative we spoke to said they don’t know where unauthorized resellers are getting the product to sell – or how they can offer the product at the prices displayed – which are oftenbelow distributor cost. Telephone Magic is your one-stop source for all things EnGenius – we are an authorized reseller carrying the rare “Elite Dealer” status as one of EnGenius’s most valued long range wireless / cordless phone dealers. So remember, iIf you see a price for EnGenius products online and it looks “too good to be true”, it is. This entry was posted in cordless telephone, EnGenius, long range, long range wireless phones, multi-line, wireless phone system, wireless telephone on August 21, 2012 by jjackson.